Gloria Macapagal Arroyo, member of the Board of Directors of the Boao Forum for Asia, Speaker of the House of Representatives of the Philippines, and former President of the Philippines, on 27 March stressed the importance of the Belt and Road Initiative to Globalization 2.0, she said, trade agreements are like the "software" to the liberalization of trade, but we also need the "hardware" - the infrastructure support provided by the Belt and Road Initiative - without which, global trade and investment cannot flourish, "that is the role of the Belt and Road (Initiative), providing the 'hardware' for the opening and the reform of the 'software'," according to Arroyo. "It is now China that is developing into a champion of openness and globalization, and that I think all goes well for Asia and for the continuation of the global trade system." She added, China is working on a win-win development of a shared future, so China's rising is also good for the world, and if we look at the 70 years since the founding of new China and the 40 years of China's reform and opening-up, we can see that China has given the whole world a lesson that there is not just one path for development, each country can has its own model of development based on its own historical experience and uniqueness. Arroyo further pointed out, the world should see China's rising as an opportunity rather than a threat, for instance, the Philippines has realized China is its partner in development, now China has become the Philippines' number one trading partner. China, as a market, a donor, a source of capital and technology, is investing a lot in the Philippines, not only through projects but also manufacturing, services and technology. When discussed the significance of China's reform and opening-up, she mentioned the importance of technology, she said, "I believe that one of the reasons for China's rapid transformation is its emphasis on thestate-of-the-arttechnology, and that is way back in 1977 when Deng Xiaoping said that technology would be the basis of China's development. And now, as far as the Philippines' concern, that is what we'd like to get from China: capital and technology." 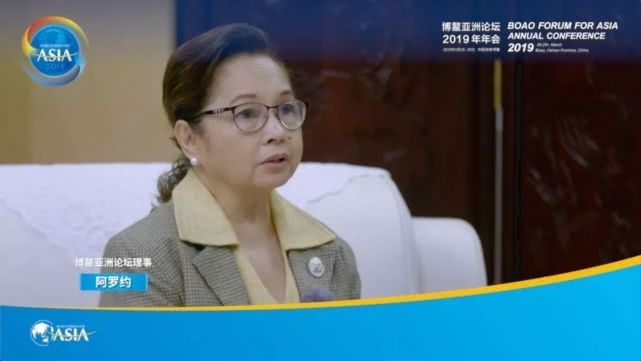 As a member of the Board of Directors of the Boao Forum for Asia, Arroyo elaborated why the Forum is very important to her, because the Forum gives an opportunity to the leaders of government, business, and society, who are engaging Asia, to step back from pressing concerns and look at the longer term and larger issues. And that is also what the value of the Forum is. At last, Arroyo encouraged the young people: I'm hopeful about the future, young people, you are going to be good leaders when your generation has its turn. Gloria Macapagal Arroyo is also permanent Honorary Chairman of the Philippine Silk Road International Chamber of Commerce (PSRICC).